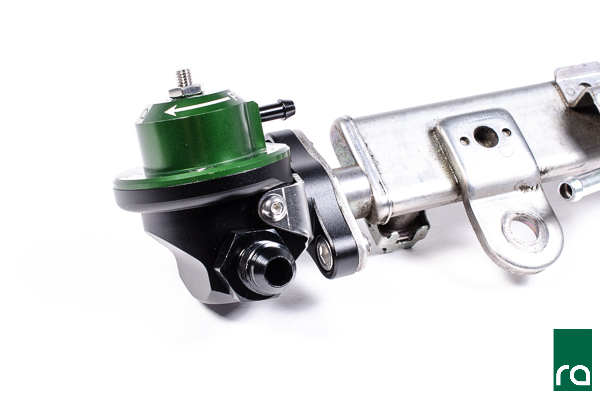 The Direct Mount Regulator (DMR) is the perfect solution for simplifying a high-flow fuel injection system. It's unique swivel inlet fitting adapts directly to the fuel rail eliminating external mounting and additional plumbing. 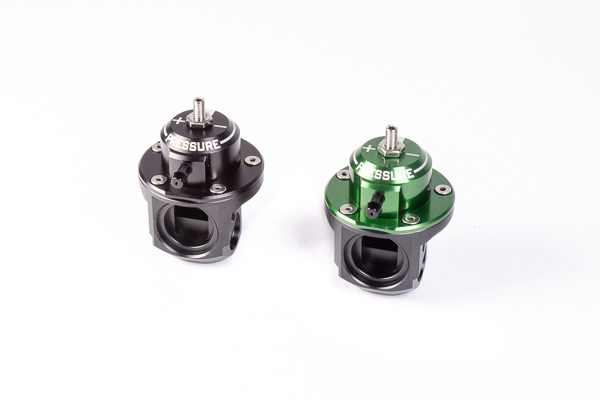 Two interchangeable orifices are included with calculated flow diameters to match the fuel pump flow to the regulator. 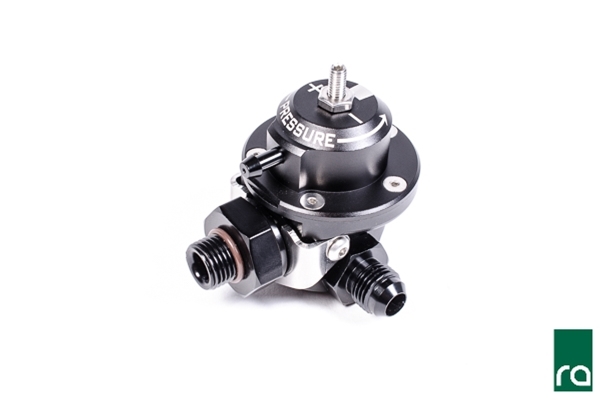 Furthermore, this added precision will resist diaphragm flutter and optimize pressure stability. See the installation instructions for more details. Either of the lower two opposing -6AN ORB ports can be used for the return line. NOTE: These ports CANNOT be used for fuel pressure gauge or sensor as these are low pressure ports. 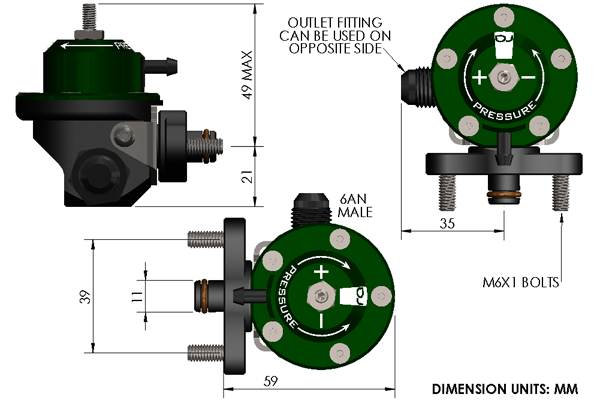 Using the included fittings, simply install the 6AN male into the port that points in the ideal direction and install the plug into the remaining port. Fuel pressure is dialed in using the preload set screw on top. The 1:1 vacuum reference high flow design has been tested to regulate over 1,400 liters per hour (see MORE DETAILS tab). Furthermore, with the addition of interchangeable return orifices, the DMR can be used most any horsepower level. Compatible with all gasoline and ethanol blends of fuel. If using 3AN hoses for vacuum lines, CLICK HERE for a compatible adapter that allows hooking up a 3AN hose for the vacuum signal. If your fuel rail has a 6AN ORB, or 8AN ORB female port, select either option below. This can be used with aftermarket fuel rails that use 6AN ORB (9/16-18 O-ring boss) threaded ports. 1. This 6AN ORB inlet port is NOT compatible with a 6AN hose end. It MUST thread into a female 6AN ORB port. 2. This variation is NOT compatible with Radium fuel rails which use 8AN ORB threads. 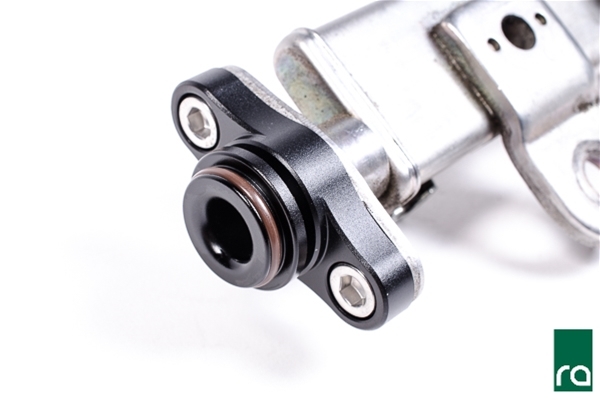 This can be used with aftermarket fuel rails that use 8AN ORB (3/4-16) threaded ports. All Radium Engineering Fuel Rails use 8AN ORB ports. 1. This 8AN ORB inlet port is NOT compatible with an 8AN hose end. 2. Currently all Radium Engineering fuel rails are compatible with this variation. While the DMR will properly secure to the these OEM fuel rails, compatibility has NOT been verified when installed with the intake manifold on the engine. In some cases, there will be an interference preventing the use of the DMR. As an example, this adapter will fit onto the Mitsubishi EVOX 4B11T fuel rail, but it interferes with the MIVEC solenoid. Reference the dimensions below to determine if the DMR can physically reside in your specific application. For example, if you have two pumps that flow 320LPH (total 640LPH), the approximate minimum pressure the regulator can achieve is about 23.5 psi. 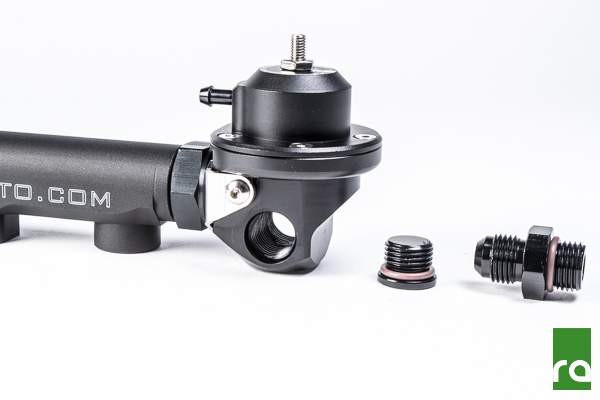 Note: if an OEM fuel pressure regulator is used for 640LPH, it will likely not be able to bypass enough fuel. With the Radium DMR, simply spin the set screw clockwise to achieve higher pressures. Note: Most EFI systems operate at 43.5 psi (3Bar) static fuel pressure.